Please allow 2 hours for your trial run, and more for any other members. Trials are not essential, but advisable as I can obtain some ideas of what you have in mind, therefore make your wedding day as relaxing as possible. I will travel to you for your trial and on your wedding day. 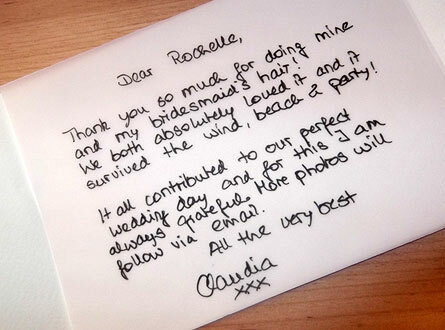 The bride will always be the first and utmost priority on the day. Allowing an hour to hour and half for the hair. Other party members may take 45 minutes to an hour, depending on the styles. You can therefore plan a simple schedule for your other appointments, such as make-up. I live in Newquay, Cornwall and can travel anywhere within an hour and a half of my location.